My big boy. Every day you continue to amaze me with the things you have learned and the new skills you acquire. This month you have perfected the art and timing of waving goodbye and saying "bye-bye" on cue. You even get a bit annoyed when people do not acknowledge your parting sentiment. You have also added "ball" and "more" to the list of most commonly understood words. You love bath time more than ever, however you are NOT a fan of bubble baths. You like your bathwater clear so you can see your piggy toes. During bath time, you like to dump cups of water on your head (you carry this activity to pool time too!) and line up your rubber duckies. Your favorite foods still include spinach quesadillas, you love blueberries more than ever, and meatballs have become a new dinner time staple. You love climbing up on our rocking chair and get great joy out of making it rock yourself. You have also begun to try to put your shoes on yourself. 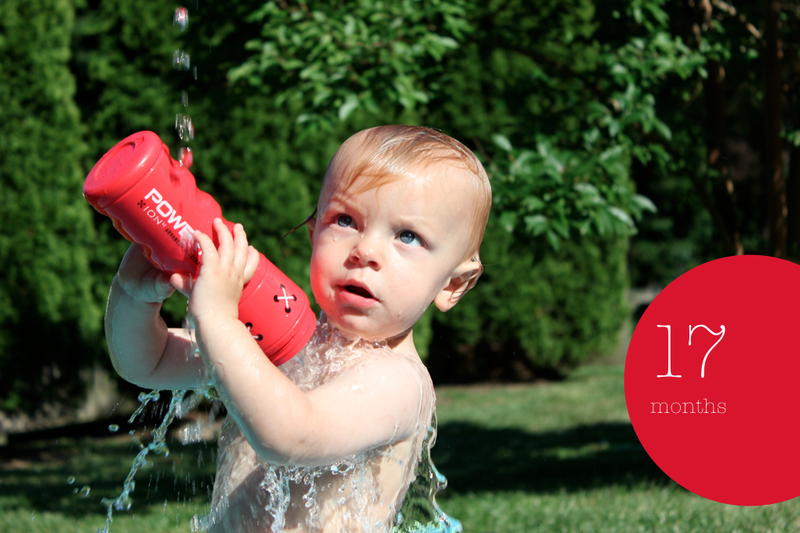 This past month we have spent less time at the park and more time with a pool or a sprinkler. Each time, it takes you a little while to warm up to the water. You are not as willing to jump right in like last summer. But I am hopeful that when it comes time for us to visit the beach, you love it as much as you have before. We have been playing so hard this month that sometimes you still take two naps on the weekends. And at those times, I remember that you are still my little baby, and not such a big boy after all. oh hayyyyyy behr!! look that little man. that first pic came out GREAT!! He had me at two naps! Stop it, he's such a little model! Love him!